Shooters will blast through nearly a tractor-trailer load of clay pigeons at the Turkey Shoot in Forsyth, Georgia. Recreational and experienced sporting clays shooters from across the country are primed for the National Wild Turkey Federation’s (NWTF) annual Turkey Shoot at the Meadows National Gun Club in Forsyth, Georgia. 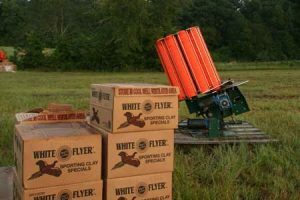 The National Sporting Clays Association-sanctioned Mega Blast Shoot that regularly draws more than 500 participants is scheduled for August 15–17. A five-stand event, 50-target events for subgauges (20 gauge, 28 gauge and .410) and 100-target preliminary events for 12-gauge, side-by-side and pump shotguns will take place throughout Friday. The 200-target main event plays out over the remainder of the weekend. Pre-event registration for all events is open through August 1, at www.iclays.com. Shooters also can register the beginning Friday of the shoot on a first-come, first-served basis. Participation in the U.S. Sportsmen’s Alliance-sponsored shooting games is open to the general public. For a small fee, visitors can test their skills in three-stand, make-a-break and wobble trap games. Tickets are also available to the NWTF banquets and auctions on Friday and Saturday evening. This is the last year the Turkey Shoot will take place in Georgia. The 2015 Turkey Shoot will take place at thePalmetto Shooting Complex, the NWTF’s future state-of-the art shooting facility in Edgefield, South Carolina. The NWTF Save the Habitat. Save the Hunt. initiative is a charge that mobilizes science, fundraising and devoted volunteers to give the NWTF more energy and purpose than ever. Through this national initiative, NWTF has committed to raising $1.2 billion to conserve and enhance more than 4 million acres of essential upland wildlife habitat, create at least 1.5 million hunters and open access to 500,000 acres for hunting, shooting and outdoor enjoyment. Without hunters, there will be no wildlife or habitat. The NWTF is determined to Save the Habitat. Save the Hunt.